The Hunger Games premiere isn’t the only exciting thing happening for me this weekend. My local Target is opening is brand new fresh foods section and I’m beyond thrilled! I love, love, love our local Wegmans grocery store, but that place is a mad house on the weekends. Come Saturday or Sunday and the place becomes the arena for a different, but equally brutal, type of hunger games. I’ve got little interest in playing that game. So, if at all possible, I avoid my Wegmans on the weekends. To be able to pick up a few fresh items at my local Target will be a huge perk during those times when I just want to grab a head of lettuce, or some fresh bananas, or a pack of chicken, without engaging in near mortal combat at my grocery store. Speaking of chicken (and Target), I was recently contacted by a company whose chicken products are now being sold in many Targets with fresh food sections. 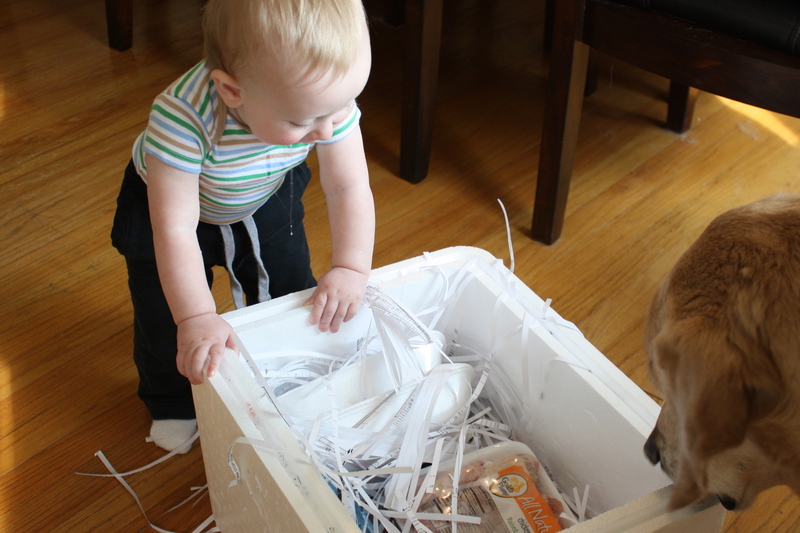 The recognition I received in Parents Magazine has brought more attention to this blog. And with that attention has come more offers to partner in various ways with assorted groups looking to promote their food or parenting related products. To be honest, I haven’t been quite sure how to respond to most of the inquiries. I’m just apprehensive about turning this place into a platform for assorted products. That’s not what this place is about for me. It’s about cooking delicious food for my family and sharing it all with you, my virtual friends. But, as I mentioned, I got this email from a mid-west based chicken company called Gold’n Plump. They wanted to send me a shipment of chicken. At first, I laughed…because no one has ever offered to send me a chicken shipment before. And then I told my husband that someone wanted me to taste their chicken. And he laughed too. I thought a lot about the chicken. And then I did a bit of research too. You see, I didn’t want to get involved in sampling any sort of product unless it met a few conditions. First, it needed to be relevant for me, my family, and this blog. And well, chicken most definitely fits that condition. Chicken is widely enjoyed by many people, including our family. 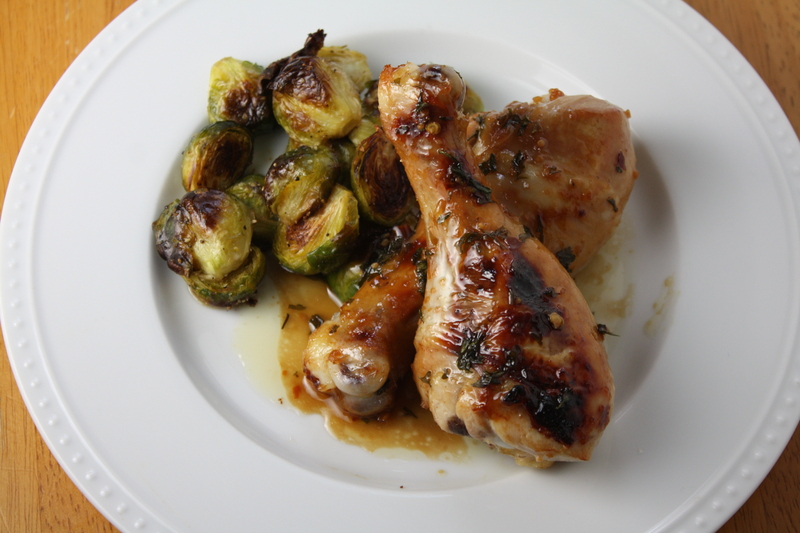 Many of the recipes on this blog feature chicken. And it’s one of the more affordable meat options for people watching their wallets, making it a great meal choice for many families. Second, it needed to be a product I could proudly stand behind. I think of it this way… When we started looking into birthday party venues for our son’s upcoming 5th birthday, someone suggested doing a party at McDonald’s. Now, don’t get me wrong, everyone in my family enjoys the occasional shamrock shake or happy meal…sometimes even a super-sized Big Mac meal. But, it’s not like I’m patting myself on my back for our wise nutrition choices when we pull through that drive-thru. That being said, it’s not really a choice I want to stamp my name on for our son’s birthday party. So, I did some checking on Gold’n Plump. I wanted to make sure that their chickens were raised humanely and that their end-product was free from preservatives or any other unnecessary, unnatural ingredients. I liked what I learned about Gold’n Plump chicken. Their chickens are raised cage-free on family farms in the mid-west. 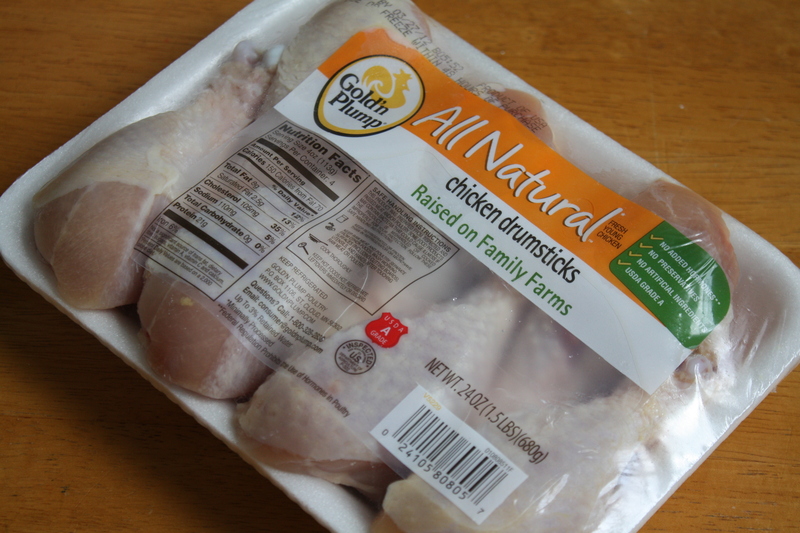 The end result is all-natural chicken, free of preservatives…just fresh, healthy chicken. It’s chicken I can feel proud to serve my family. I tell you all of this so that you understand that I didn’t take the opportunity to sample this chicken lightly. And it’s with confidence that I write about it here. Gold’n Plump sent me a cooler with a big pack of boneless, skinless chicken breasts, two packages of ground chicken, and a package of drumsticks. I rarely buy chicken drumsticks, so those instantly caught my eye. 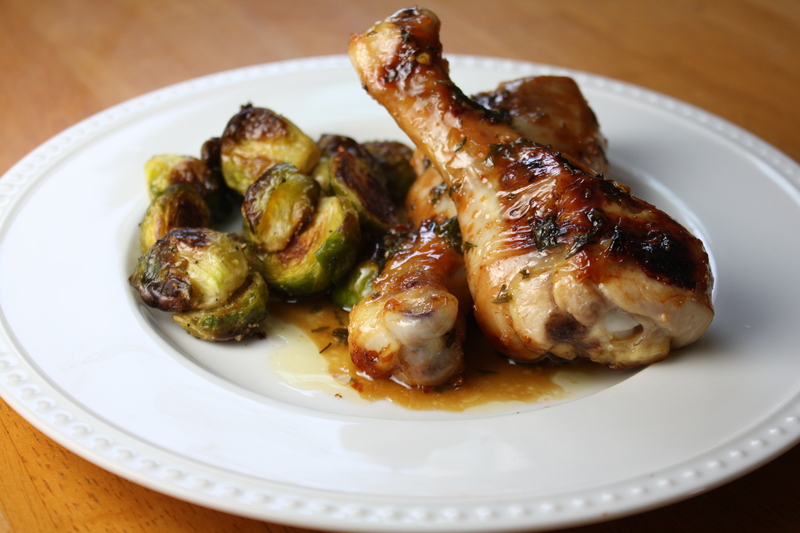 I immediately reworked my dinner plan for the evening to make some honey-garlic drumsticks with a side of roasted brussels sprouts. 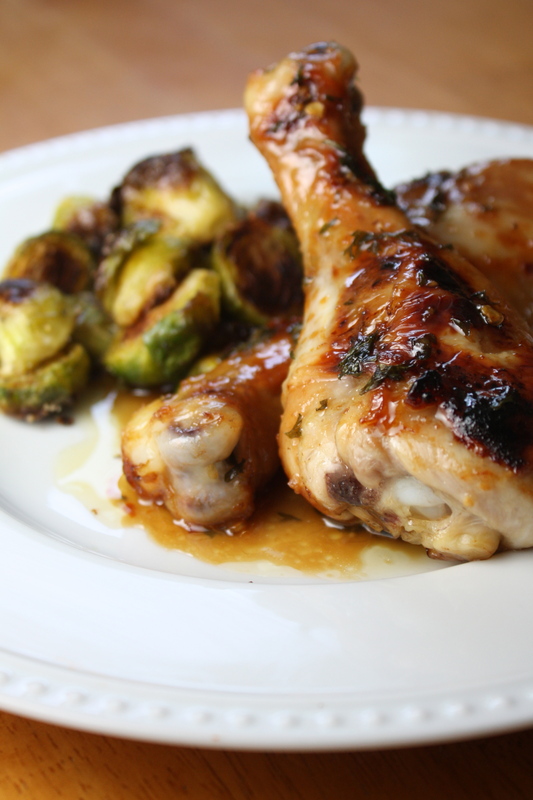 And the chicken drumsticks were really good…so moist and delicious! I used the chicken breasts over the weekend to make a big batch of my Chicken, Bacon, Ranch Chicken Salad, which my husband has been nudging me about since he finished the last bite of our first batch. The breasts were well-trimmed, fresh, and delicious. I haven’t had a chance to use the ground chicken yet, but I’ve got my sights set on some Buffalo Chicken Meatballs (with the 90/10 ground chicken) and maybe a chicken chili with the extra lean (95/5) ground chicken. I was quite pleased with the chicken I sampled. I’m picky about the meats I purchase, but I will feel confident picking up Gold’n Plump chicken if I see it at my Target’s new fresh foods section. Even better, Gold’n Plump currently has a coupon available. And isn’t it always a nice treat to save some money on some good, healthy food for your family? If your Target carries fresh foods, keep an eye out for Gold’n Plump (and don’t forget your coupon)! To prepare the sauce: Melt the butter in a saucepan over medium-low heat. Add the garlic and cook for about 3 minutes. Turn off the heat. Add the soy sauce, honey, parsley, and crushed red pepper. Stir to combine. Taste and adjust seasoning with salt and pepper, as desired. Set aside to cool slightly. Preheat oven to 400 degrees. 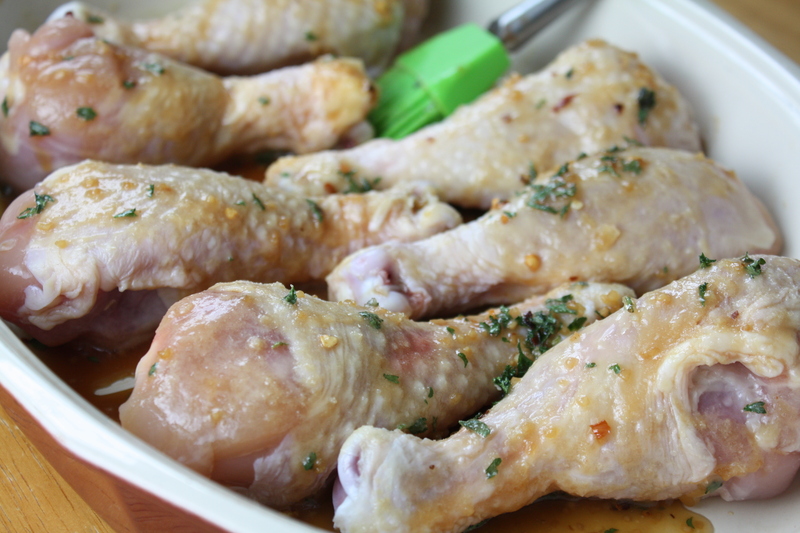 Arrange the chicken drumsticks in a single layer in a baking dish. 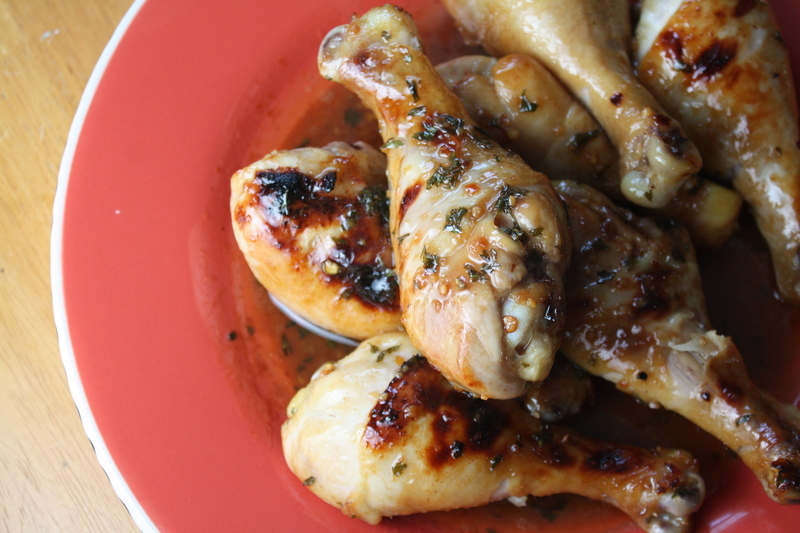 Pour the honey garlic sauce over the drumsticks. Roll the drumsticks in the sauce to coat all sides. Bake for about 40-45 minutes, until the chicken has reached an internal temperature of 165 degrees. Gold’n Plump provided me with the chicken to sample. All opinions expressed in this post are fully my own. Posted in Food, Main Course, Poultry, Recipes and tagged chicken, comfort food, Cooking, easy dinner, Eating, family, Food, kids, Recipes. Bookmark the permalink. Thank you for posting this. My Target also started carrying this, and we enjoyed it last week. It’s great to know they’re also a conscientious company! Can’t wait to try try your chicken recipes with it! Those look pretty yummy! I was surprised at the selection at my Target. I don’t shop there often, but I was pleased at how many non-chemical laden options there were compared to their previous grocery area. It’s not the perfect place for me to do my weekly shopping (I have very specific requirements for better or worse) but it’s a much better place to shop for a snack for the ride home than it used to be. Very easy and fast and YUMMY! Did it – Loved it! Bit too sweet for my boyfriend’s taste, more left for me 😉 Thanks for sharing! I made this dish a few weeks ago and it was an instant hit! My sister has requested it so many times since then, and she’s a really picky eater. I added more butter and garlic and skipped the pepper flakes to suit my family’s tastes better and it came out amazing. It goes really well with a simple cold potato salad. Thank you for this wonderful recipe! I’m going to try this recipe this week. It looks great! Being from the Midwest, I’ve been a Gold’n Plump fan for years. Great, unadulterated, clean and well trimmed pieces. Shouldn’t be a problem, but for the sake of food safety, I would make sure the sauce is completely cool first. You don’t want to add raw chicken to a warm sauce and then let it sit overnight. Could you use chicken breasts or chicken tenders? Made this tonight and really enjoyed it! Used chicken breasts instead of drumsticks and decided next time to make a little more of the sauce.